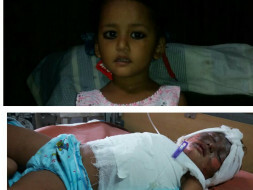 My maid's grand-daughter, 3 year old Poornima Arun Singh had a freak accident yesterday. 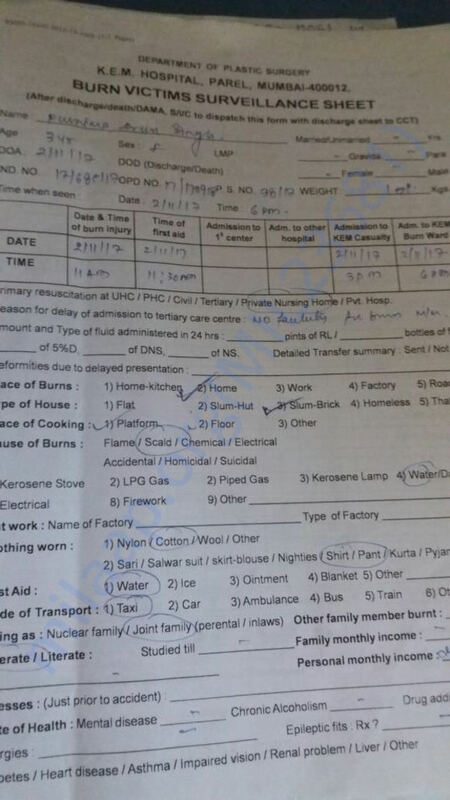 She fell into a boiling hot water tub that her mother had kept in their 10 x 10 Chawl room where they stay. She got pushed by a neighbors child and fell headfirst into the tub and has suffered 50% burns. She is in an extremely critical condition. Two hospitals refused to take her in (due to very low survival chance) while the child howled in extreme pain until she collapsed in exhaustion. For 3 hours the parents ran from hospital to hospital in hope to find some treatment for their only child. Finally, Poornima was admitted in KEM hospital and according to doctors' every passing hour will determine whether she'd survive or not. Meanwhile, the parents are incurring a daily expense of INR 5,000 for her dressing and medicines. It will be impossible for the parents (father is a daily laborer and mother works as household help) to sustain this treatment beyond a week or so. It is with the in therefore the spirit to help someone in need, I stepped in to create this fundraising page. The amount of INR 2.5 L will help them afford her medical expenses up to 6 weeks or so. I'd be happy to keep providing updates regarding the condition of the child every couple of days. p.s. - In the event, that the child succumbs to her condition (I hope not!) , I'd be very transparent and fair and return all funds back to the supporters. Here is an update on Poornima. As the baby is inching towards her recovery, would like to thank all the supporters for the love you have shown Poornima. Unfortunately, the family has exhausted all their funds for the treatment cost them a fortune. They need to travel every day for checkups. 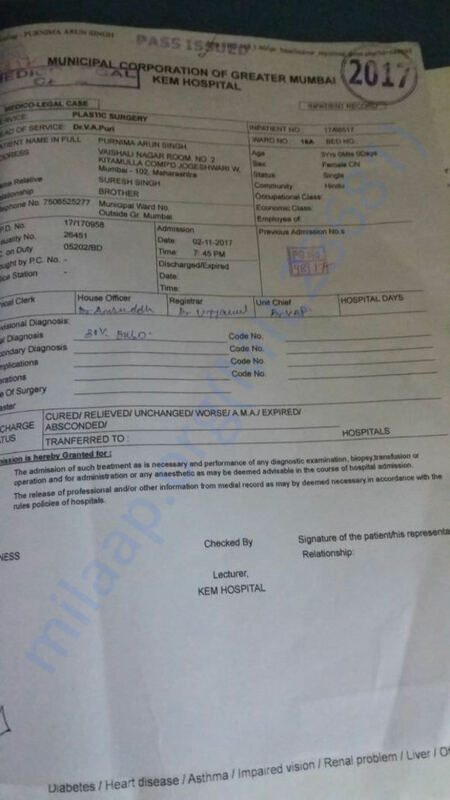 Withdrawing one lakh to help the family to pay the hospital bills, medicines and there are a lot of day to day expenses. The baby requires food and juices every day which will help in her recovery. Doctors have also recommended her to visit National Burn Center, Airoli as burns have damaged her original skin. Thank you for all the love and support. Please pray for her and speedy recovery. 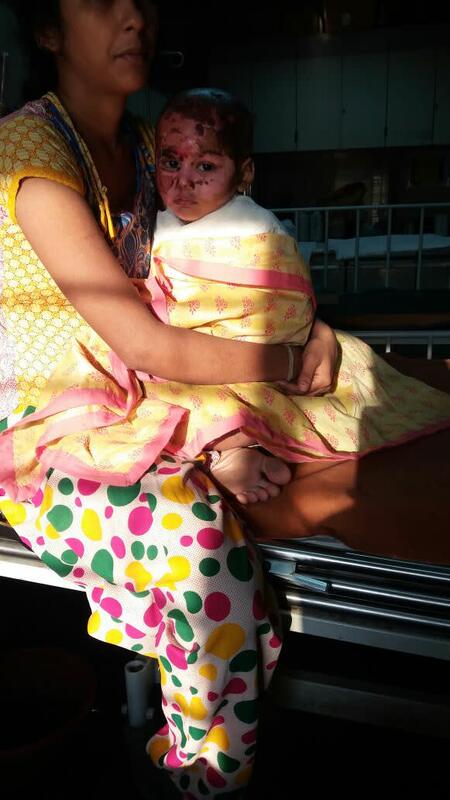 Here is Poornima with her mother in the hospital, after 1 month's treatment. She has lost her beautiful black here but is slowly inching towards recovery. Her scathed skin is also coming back. The parents are relieved to see her stand on her feet. I wanted to extend heartfelt gratitude to everyone who kept her in their prayers and supported us. Please feel free to reach out to me in case of nay further queries. I am writing to share that Poornima is clinically out of danger now. She will survive! Phew! Something that seemed to be so far fetched in the first 48 hours of the accident. However, it's going to be a long ordeal for the parents to see their child go through rounds of dressings and bandages until the burned skin heals. The silver lining is that she has opened both her eyes, is taking food orally, is able to utter a few more words, is crying less, is cooperating with doctors and her parents and is responding to the treatment. The skin hopefully will take 2-3 months to resurface back to normal. We are hoping that the 3 year old does not have to go through series of skin grafts or flaps that require months of healing and rehabilitation. Most importantly, my hope is that she is able to forget and be as minimally affected psychologically with the trauma of this accident. 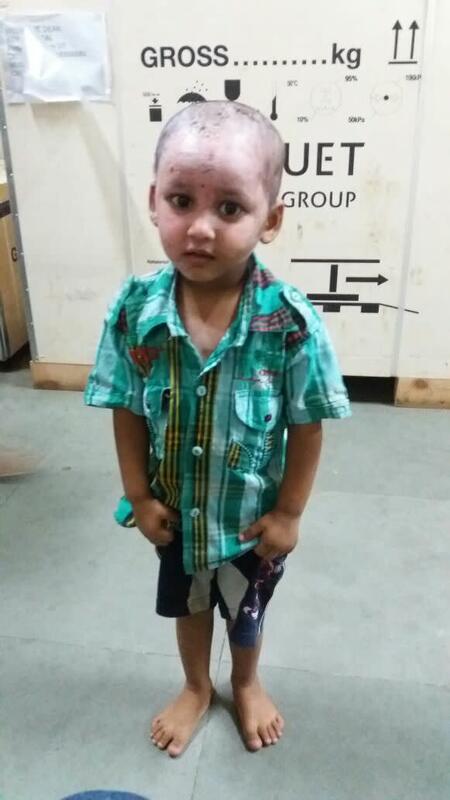 I would also like to pass along the gratitude of her parents - Sita and Arun, who had nothing to say but a genuine hand-folded, teary eyed thank you to each one of you who could make it possible for them to afford the daily expenses of this treatment. Never had they remotely imagined that people from far and wide, known and unknown, would join hands with them to make their daughter LIVE. I feel blessed and lucky to have played a small role in bringing all of you together to support Poornima. Since we have gathered sufficient funds to support her treatment for at least 1-1.5 month, I am closing the fundraiser for now. However, I'd be happy to continue sharing her recovery updates with you as and when I receive them from the parents.